The Alberta government is raising the Transgender Pride flag to commemorate victims of violence who were attacked for identifying as transgender. Minister Miranda raises a flag for Transgender Day of Remembrance. On Nov. 20 each year, flags are raised around the world on Transgender Day of Remembrance to memorialize those who have been assaulted or had their lives taken from them because of transgender hatred or prejudice. Introduced an “X” marker on official documents, such as driver’s licences and ID cards, and made the application process easier for Albertans looking to change the marker on their identification. Developed LGBTQ2S Youth Housing and Shelter Guidelines, the first of their kind in Canada. Required all publicly funded schools to create welcoming, caring and respectful policies, and to make GSAs publicly available. Amended the Alberta Human Rights Act to include gender identity and expression. 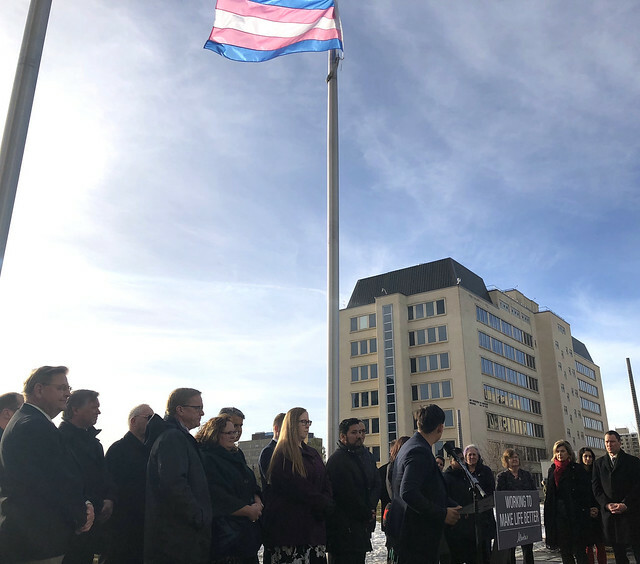 Raised the Transgender Pride flag at the Alberta legislature for the first time in 2015 – an annual event at McDougall Centre and the legislature.